Another successful year. The schools and other interested groups all got together for a grand litter pick in April. The judging took place at the end of July. We were runners up and have been awarded £150 for use in the village for the benefit of the community. Well done everyone. Next year we can try for the grand prize of £500. The people of Blisworth are mindful of the scourge of litter. 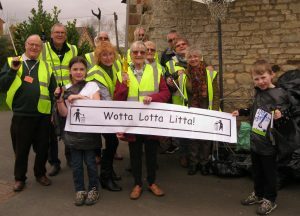 Every year, in the early spring, we hold a village litter pick, with volunteers taking responsibility for a street or two. Many people continue to clear our street of litter, carelessly dropped, throughout the year because they know how much the community loves clean streets. The parish council provide ample bins for the disposal of dog waste and the bins are regularly emptied. They urge people to take normal litter home as the bins are not designed for general litter. Sadly, there are some in the village who fail to pick up dog waste. The football pitches have to be inspected before games, the towpath, where many walk, can be tricky, and, generally, the few spoil it for the many other walkers. Dog owners who are caught will be reported.